You might have heard about dental implants before, but you might not know as much about mini dental implants. This is a relatively new type of procedure that handles things quite a bit differently. With traditional dental implants, it requires many visits to the dentist, as well as surgery. However, this option will eliminate the need to have surgery. With these types of implants, the dentists can put the anchors in the person’s jaws noninvasively and during a single visit. This type of procedure is most commonly done to help stabilize dentures. The mini dental implants will hold the prosthesis in place firmly, so you will never have to worry about having dentures that are loose again. The treatment does not require any bone grafting, and because of this, it means the treatment is much faster. In fact, it is simple enough that there is no recovery period, and the patient can have the dentures fitted the same day. The design of the structure helps to promote fast healing. This makes it a much gentler option, and it could be a good choice for you. They have a range of benefits including easier cleaning, clearer speech, easier biting and chewing, no need for cutting or sutures, high success rate, and permanent results to name a few. They could be the perfect choice for you. 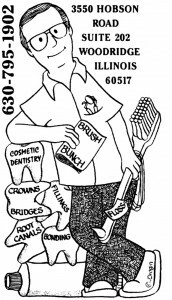 Make sure you get in touch with our dental implants specialist in Woodridge at Machnowski, DDS. The dentists are ready to help you learn more about the mini dental implants, and your other restorative dentistry options. You can check out our contact page, or you can call us at 630-795-1902. We are ready to help you.